In 1902, the Bunbury Municipal Council met to discuss prospective sites for establishment of a new cemetery. They recommended that a Cemetery Board be appointed. The WA Government Gazzette of March 1912 noted allocation of a reserve for use as the Bunbury Public Cemetery. 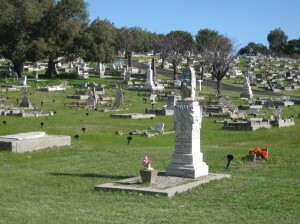 The Municipality of Bunbury was appointed trustee under the Cemeteries Act, 1897. In June 1912, tenders were called to fence the new cemetery site. In February 1913, tenders were called to clear a road to the new cemetery and clear 10 acres of the cemetery site.